With over 200 mashups to my name and my intention to release a new CD-length volume every month or two, the Collected Mashups Series is going to take a while to release, especially with the special bonus tunes (remixes, remasters, instrumentals, and previously unreleased stuff) I plan to include along the way. Due to popular demand, and with many of my most well-known mashups currently off-line, I've decided to also release a few Collected Mashups Series samplers (EPs), which include tracks from my entire 2004-2011 "oeuvre," assembled according to specific themes. 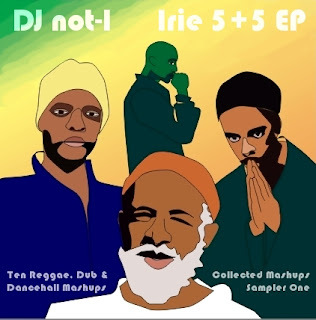 This is the first such sampler, and since summer has finally arrived, I was inspired last weekend to collect ten of my reggae/dub/dancehall mashups in one EP. Have fun and stay irie! Produced for the GYBO Reggae/Dub/Dancehall Challenge. To be re-released on "Year Of The Pig" (Collected Mashups Vol. 3)" (forthcoming). Taken from "The Bo Diddley Tribute Mixes". 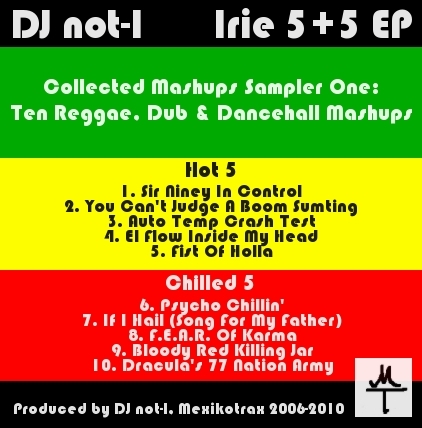 To be re-released on: "Collected Mashups Vol. ?" (forthcoming). Taken from The Shinobi EP. To be re-released on "Collected Mashups Vol. ?" (forthcoming). To be re-released on "El Álbum Latino (Collected Mashups Vol. 3b)" (forthcoming). Produced for the GYBO Reggae/Dub/Dancehall Challenge. To be re-released on "Year Of The Pig (Collected Mashups Vol. 3)" (forthcoming). Produced for the GYBO Weekend Challenge VI. To be re-released on "Collected Mashups Vol. ?" Taken from "MashAnthology (Collected Mashups Vol. 1)". To be re-released on "Year Of The Pig (Collected Mashups Vol. 3)" (forthcoming). Produced for the GYBO Weekend Challenge III. To be re-released on "Collected Mashups Vol. ?" (forthcoming). 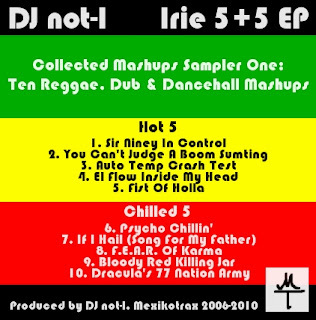 Produced by DJ not-I, Mexikotrax 2006-2010. Original cover art (singles) by Klaudia Gottwald. New cover art (EP) by not-I.